Who would have expected that such a game like Stardew Valley would become huge popular in no time? But why? 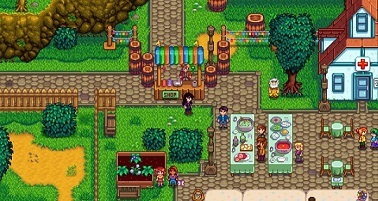 It's simple: you love the game and the fact that the one-man developer Eric Barone, ConcernedApe devotion care and fixed all the bugs and added new features that make Stardew Valley more beautiful and never let be boring. ConcerdedApe never expected this rush to his game, he is now quite a sweat, when it comes to keep everything running. For this reason, developer Eric Barone has recently decided to get support for technical things, to work on the new game content for the update 1.1 faster and more intense way. Consequently, the publisher Chucklefish will now take care of the connections for Mac, Linux and console as well as to the location in a different language regions and to the technical side of the multiplayer mode. - The NPC Shane and Emily are suitors. So you guys have with them will soon be more cutscenes and dialogues. Things from this list can of course still change or even added something new. ConcernedApe has planned a lot for the future. Among these are things that are already in progress, such as the multiplayer mode. First of course is the update 1.1 that brings you a lot of new content.